I have been called a traveling minstrel, so of course my bicycle is “The Minstrel Cycle.” Just as my music is evocative of the 1960s and 1970s, so too is this vintage Schwinn ten-speed. You might say The Minstrel Cycle is a period piece. With the help of a Schwinn date code database and with Guido's explanation of the four digits lightly stamped on the head badge, I figured out that my bike was built on October 27, 1976 . From now on it will be honored with a birthday party every year. When I acquired this bicycle in the early 1980s, it had its original yellow paint and factory decals. I wanted a red bicycle, so I soon repainted it with red spray paint from rattle cans. It has carried me many thousands of miles since then, nearly all of them with me simultaneously playing a solid-body electric guitar as I ride the bicycle “no hands.” Sometimes I plug into a battery-powered amplifier carried on a rack over the rear wheel so other people can hear me as I ride and play. In the Fall of 2001 , the man at the local bicycle shop replaced all the bearings and cables. Afterwards, I used rattle can red spray paint again. This time though it wasn't as good a job as the first time I had painted it twenty years earlier. For years I had forgotten what model of Schwinn this was. I thought it was a Continental because of the tubular front fork (not flat like a Varsity's). I learned its true identity in December 2002 . In the Winter of 2002-03, I finally had the bicycle professionally painted and had its wheels and brakes upgraded. It now has quick release wheels and center-pull brakes. In the Summer and Fall of 2009 some other parts were also replaced as described in some of the following hyperlinked web pages. Creation of The Bicycling Guitarist This isn't about the bicycle directly, but describes how and when I started riding it with no hands while playing guitar. Schwinn Continental This page was written when I mistakenly thought my bicycle was a Schwinn Continental. Schwinn Sportabout describes how I discovered what model of Schwinn I actually have. Photographs from the Fall of 2001. Schwinn “Sportinental” What do you get when you cross a Schwinn Sportabout with wheels and brakes from a Schwinn Continental? March 2003 . Another Schwinn Sportabout Photographs and description of a stock Schwinn Sportabout discovered on eBay in August 2003 . NOS parts “New Old Stock” (an oxymoron?) parts acquired from eBay in August 2003 . NOS parts installed on my bicycle, photographs taken August 20, 2003 . Paint scratch repair, my attempt to make the right front fork look like new again. September 2003 . More new parts, a snazzy new seat, NOS rear derailleur, and a new chain. September and October 2003. A shiny ten-speed bicycle has more photographs taken in September and October 2003. Lynn's Schwinn describes the rescue of another Schwinn Sportabout from a trash dumpster in June 2008 . Schwinn lightweight bicycles history is a page of information from Raleigh D. who sent me this information by email in April 2009 . 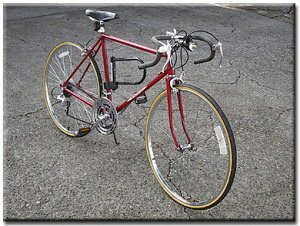 Suggestions to upgrade my Schwinn Sportabout is the second page of Raleigh D.'s content, offering specific advice on how to further improve my ride. A better handlebar for my Schwinn Sportabout shows an aluminum handlebar and stem with more information from Raleigh D.
New Crank shows the replacement of the stock Sportabout crank with a better “diamond” Schwinn crank. August 2009 . New Wheels shows vintage Schwinn Approved quick release hubs laced to modern aluminum rims. October 2009 . Upgrades to my Schwinn in 2009 shows major improvements made to my bicycle in that year. October 2009 . Schwinn Super Sportabout is my new descriptive name for this bicycle's current configuration. Introducing Lady M a Ladies' model 1977 Schwinn Sportabout.